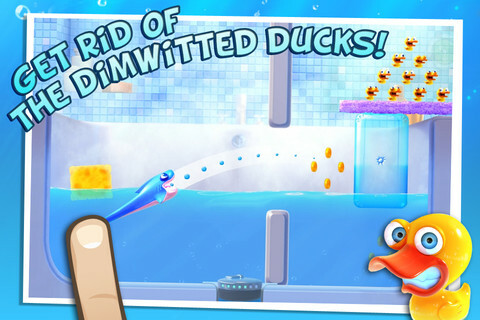 Gameloft's new physics puzzler splashes down. But is it a smash-hit or a little soggy? You can be forgiven a little cynicism when approaching a Gameloft title these days. The developer has something of a history for delivering, ahem, homages to some of gaming's most celebrated franchises, whether it's the Halo-esque N.O.V.A or the even cheekier Modern Combat 2. Their latest game, Shark Dash is a colorful physics puzzler that can't help but remind us of an Angry Birds-meets-Cut The Rope affair. Main character Sharkee finds himself, for reasons never explained in great detail, merrily swimming around in his bathtub, only to find his relaxation time interrupted by a swarm of rubber ducks. Clearly they have to go, and Sharkee achieves this by gobbling them up. 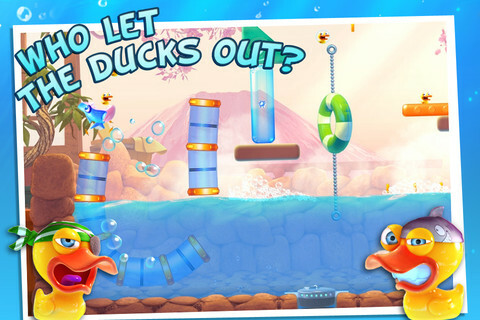 Gobble up those rubber duckies to clear each level. Unfortunately for him these rubber foe are strategically spread out across the bathroom, and with a limited number of sling-shot moves available for each level, there's no small amount of careful planning required to get the most out of each attempt. Holding your finger down on Sharkee and stretching him back to varying degrees sends him flying away at your choice of speed and trajectory. Rationing your moves carefully is essential if you're to take down the ledges, bubbles and sponges that sit between him and his dinner. Pipes provide zippy shortcuts around levels, while rubber rings add a speed boost should he manage to fly through one. Rubber rings and pipes keep you flying around the levels. Bounce out of the tub and it's a very definite game over. Likewise, should Sharkee find himself a fish out of water and unable to at least flounder his way back into the drink, your current attempt will end. Should any level become too frustrating, you can skip it in exchange for the coins you've either collected in-game, or purchased from the App Store. Elixirs that offer you the chance to undo an errant maneuver are also available for real-world cash. There are 24 achievements and missions that accompany the 96 levels, taking in environments that range from the common household bathtub to Rome and Japan. While progress through the levels is brisk, you'll need careful forethought and pin-sharp execution if you're going to take home the maximum three stars on each level. Plan out your limited moves very carefully indeed. 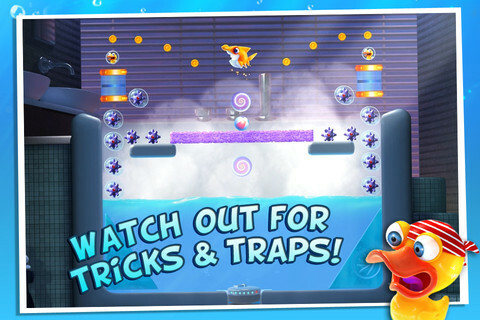 The complexity ramps up as you progress through the game: the explosive mines can undo you completely, yet can also be used to pop the bubbles that keep the ducks suspended in mid air. A well-aimed shot through the chains that anchor various items to the bathtub will release them, creating yet another domino effect as the scenery crashes and tumbles, helping to bring those delicious little duckies towards Sharkee's jaws. There's variety in the art style, and unspoken humor in the action that plays out, but there's also a nagging sensation that I've played the underlying meat of this game many times before. In fairness to Gameloft this is not a criticism unique to Shark Dash, but the end-result is that the game's undeniable charms fall flatter than they otherwise would. That said, if you're looking for something to scratch that physics puzzler itch, you can do an awful lot worse than pick up Shark Dash. Just don't expect too many surprises. What's Hot: Challenging levels and varied environments. What's Not: A rather overbearing sense of deja vu.